Beyond a local nature guide or bird figurines, every birdwatcher needs a sturdy and reliable pair of binoculars. Budget shoppers will take pleasure in the Bushnell Powerview 8×21 Compact Folding Roof Prism Binocular – priced under $20. For the more adventurous, the Nikon 7430 Monarch 8x42mm All-Terrain Binoculars (~$200) offer 100% waterproof and fog-resistant luxury. An avid reader generally cozies up to a good book at any time of the day. Unfortunately, some readers struggle to find an adequate source of light during their nighttime indulgences. Suggested gifts for avid readers who enjoy reading at night include lamps with elongated flexible necks, personal magnifiers, and comfortable items, like the Homedics BRF-2L Foldable Massaging Back Rest with LED Light . You can never have too many fishing gadgets when it comes to catching, cleaning or releasing the prized catch of the day. Surprise a loved one with the Trademark Fisherman’s Outdoor Tools Collection which contains two fishing knives, 6-inch half serrated/half smooth blade, 6-inch knife blade, nail/line cutters, and a convenient 8 in 1 fisherman’s pliers. No more misplaced golf clubs. The Golf Pro© Personalized Bag Tag is a thoughtful way to separate the stylish golfer in your life from the rest of the bunch. Personalization Mall allows gift-givers to customize four lines on one side, such as name, cell phone number, address or whatever your heart desires. 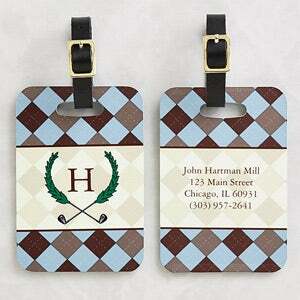 The other side bears the initial of the golfer – printed with an exclusive argyle design. The world of arts and crafts includes a wide range of talented individuals that includes knitters, seamstresses, woodworkers, and jewelry makers. There is one thing they all have in common – the need to store their supplies. A highly functional gift for crafters is to provide a place to hoard their beads, needles, tools, and materials. Sometimes, a box or travel case will do, while others need more space, like the Craft / Sewing Machine Cabinet Storage Armoire Organizer Drop Leaf Table . With millions of pet owners stretching across the world, the number of thoughtful, creative, and useful gifts for dog lovers is endless. When it comes to pleasing some family and friends, putting Fido first is a must. What better gift for a dog lover than to have a friendly reminder of the slobbery welcome or boundless ball of energy waiting for their return home. Choose a dog-themed picture frame to liven up an office setting, such as the Bone Shape Paw Prints Photo Frame or Man’s Best Friend© Personalized Frame, which offers an easel back design for table top display. Calendars with dog themes come dime a dozen, but for computer savvy family and friends, choose a Design your own Pet Calendar , which creates an 11″ x 17″ durable wall calendar with a plastic spine. With adorable pet photos and drawings, use Art Pages and markers to decorate each month of the year. The set shown comes with the choice to send materials in for production or use digital photos and provided Internet drawing tools to make an entire calendar online. For the dog lover whose recently welcomed a new furry addition to the family, make the transition less stressful by gifting the D.A.P. (Dog Appeasing Pheromone) Collar , which actually mimics the pheromone that mother dogs produce to calm and comfort her puppies. The collar comes in two sizes: Puppy/Small (for up to 15-inch necks) and Medium/Large (for up to 25-inch necks). For those who need coffee to jumpstart their morning, cups and mugs highlighting pet breeds make a popular present for dog lovers. This personalized Stainless Steel Travel Mug comes in 84 unique breed designs with scripted names in red. Commuters will appreciate this travel mug that holds nearly 2 cups of coffee. 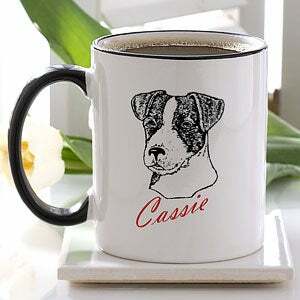 For office and home drinkers, Personalization Mall also offers an equally pleasing White Ceramic Coffee Mug with an artistic sketch of specified dog breeds. If you’re looking for an item to include in a gift basket for dog lovers, consider healthy treats for their faithful companion. For example, Zuke’s Mini Naturals Dog Treats offers a wholesome blend of natural ingredients in their Chicken, Peanut Butter, and Salmon treats. This made-in-the-USA product uses meats, grains, fruits and vegetables to create semi-moist mini-treats – only 2 calories – meaning the snacks accommodate the diet of pooches of all sizes. No artificial colors, flavors or additives – just a combination of high-quality proteins and grains that pack a satisfying boost of vitamins and minerals.